Ceremonies at Wellesley can be booked in Houghton Chapel, the Multifaith Center and the Alumnae Hall Event Lawn. Reservations and arrangements for all ceremonies can be made directly through the Office of Religious and Spiritual Life. Our summer wedding season takes place between mid-June and mid-August. Weddings may be booked at other times throughout the year, however, College events may preclude some of these dates being available. Venues are available for ceremony use by members of the Wellesley College community (faculty, staff, students, alumnae and their immediate relatives) at a discounted affiliate rate. Those without an affiliation to Wellesley College are permitted to schedule a wedding at a different rate. We welcome couples of all sexualities and gender identities to be married at Wellesley College. Space for an on-campus reception is available at the Wellesley College Club. Reservations for space at the Wellesley College Club must be made directly with them by calling (781) 283-2700. Please note that reserving the Chapel, Multifaith Center or Alumnae Hall Event Lawn DOES NOT also reserve the Wellesley College Club. For example, if you have reserved the Chapel, you must contact the Wellesley College Club directly to then reserve space for the reception. Receptions may also be held on the Alumnae Hall Event Lawn for an additional fee through the Office of Religious and Spiritual Life. Renters of this space must supply their own chairs and/or equipment needed for their reception, including a generator if needed, as there are no electrical outlets. Houghton Chapel sits at the center of the Wellesley College campus. The Chapel is used for weekly worship as well as for musical and educational events. In scheduling ceremonies, it is important to realize that the Chapel’s availability is limited and is dependent upon many other College activities. Reminder: there is no air conditioning in the Chapel. 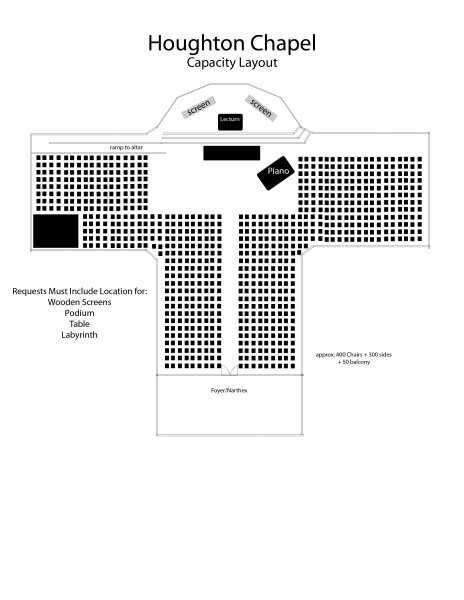 The Chapel set-up is as follows: 400 chairs in straight rows with a 90 foot center aisle, two wooden screens located on the stage, a large wooden altar table located on the floor in front of the stage, a Grand Piano on the floor to the right of the stage, and a Fisk Organ located to the rear of the Chapel. The Houghton Chapel at the normal layout can hold 400 people. Additional fees may occur for non-standard set up in the Chapel (i.e special placement of the chapel chairs or the removal or replacement of other chapel items). These special requests require additional technicians and custodial staff to be on-duty at an over-time rate, on average ranging between $150 to $300, which will be discussed and confirmed with the renter prior to the date of your ceremony. The Houghton Chapel at the capacity layout can hold up to 750 people. Any special set-up will require notice at least 4 weeks prior to your ceremony. This will ensure that the proper work-order can be placed and completed. For further information, please contact the Chapel Coordinator. * Please note that candles and matches are not provided. * Please note that there are no small tables provided for your ceremony; however, you may bring one into the chapel. The Houghton Chapel is accessible by means of a ramp to the east transept door. The Multifaith Center is accessible through the center entrance located off of the Chapel Plaza. There is an elevator located between the upstairs (the Chapel) and the ground floor (Multifaith Center) where the restrooms are located. For questions regarding handicap accessibility, please contact the Coordinator of the Houghton Chapel and Multifaith Center. What is the Multifaith center? Opened in the fall of 2008, the Multifaith Center offers a spiritual environment for people of all religious traditions and spiritual practices. The worship space in the center main room will seat up to 150 people. Like the Chapel, the Multifaith Center’s availability is subject to College use of the space. The Multifaith Center is available for small receptions (please see the Fees section). Restrooms are available in the Multifaith Center. Reminder: there is no air conditioning in the Multifaith Center. The Multifaith Center is accessible through the center entrance located off of the Chapel Plaza. Houghton Chapel is accessible by means of a ramp to the east transept door.There is an elevator located between the upstairs (the Chapel) and the ground floor (Multifaith Center) where the restrooms are located. For questions regarding handicap accessibility, please contact the Coordinator for the Houghton Chapel and Multifaith Center. You must make your own arrangements for flowers and runners to be placed in the Chapel, Multifaith Center or Alumnae Hall Event Lawn. Depending on the Chapel schedule, your florist may deliver flowers one hour prior to your ceremony. Any special arrangements can be made by contacting the Chapel Coordinator. Flowers may be placed on the worship table in the Chapel, provided the wood is protected, or on standing holders, which must be supplied by your florist. You are responsible for removing all flowers from the Chapel after the ceremony as a courtesy to other events scheduled. Runners are usually acquired through your florist as well. The center aisle in the chapel is 90 feet long. The clergy person who is officiating at your ceremony must approve all musical selections to be performed. Courtesy and professional etiquette require that the Wellesley College Organist (or their designate) play at all ceremonies that use the Chapel Organ. The services of the Organist do not automatically come with booking a ceremony, and require a professional fee. You must contact the Organist about playing for your ceremony, contracting other musicians, and/or approving other musicians at least six months in advance. You must make your own financial arrangements with the Organist or musican(s). The musician fees must be paid in full prior to the ceremony. Often the planning of the music can be handled via telephone or e-mail for services. For services involving several soloists or a complicated liturgy, a personal consultation is advised. The Organist will be glad to help you engage the services of an instrumentalist or vocalist for your ceremony, or to work with a soloist of your choosing. The rehearsal time must be planned around the schedule of the Organist and availability of the space with the College, and may be subject to an additional custodial fee. There is one small microphone available for use in the Houghton Chapel attached to the Podium. 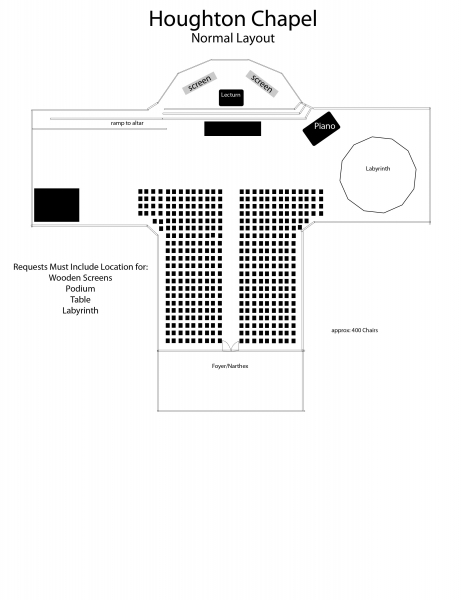 For additional needs for microphones and speakers, please see the Preferred Vendor Lists. *The fee includes rental of the space, 1-hour rehearsal time with the Chapel Coordinator, and 3-hour allotted ceremony time with the Chapel Coordinator. A non-refundable deposit of 50% is required to confirm the date and time of the service. Full payment and completed wedding contract are due THREE months prior to the date of your ceremony. A 50% non-refundable deposit is due to reserve the date. Wellesley College Custodial Services will open the Chapel and be on duty for a half hour before your scheduled rehearsal and one hour prior to your scheduled ceremony. Custodial Services will be on duty for standard break-down following the ceremony. The facility fee listed above includes a standard set-up by custodial services. Any non-standard set-up will be subject to an additional fee which will be discussed and confirmed with the renter prior to the date of your ceremony. Additional fees may occur for non-standard set up in the Chapel (i.e. special placement of the chapel chairs or the removal or replacement of other chapel items). These special requests require additional technicians and custodial staff to be on-duty at an over-time rate, on average ranging between $150 to $300, which will be discussed and confirmed with the renter prior to the date of your ceremony. Any special set-up will require notice at least 4 weeks prior to your ceremony. This will ensure that the proper work-order can be placed and completed. If you have any questions or would like to request a non-standard set-up, please contact the Chapel Coordinator. Persons having their ceremonies at Wellesley College may arrange for outside clergy or other authorized persons to perform services. Outside clergy or other authorized persons performing your ceremony must be approved by the Office of Religious & Spiritual Life. You must make your own financial arrangements with your Officiant. The fee must be paid in full prior to the ceremony. Members of the Wellesley College Office of Religious and Spiritual Life may also be available to preside at these ceremonies as their schedule permits. The fee is $500 for preparation and celebration of the ceremony. To inquire about the availability of Chaplains for this purpose, please contact the Chapel Coordinator. Courtesy and professional etiquette require that the Wellesley College Organist (or their designate) play at all weddings that use the Chapel Organ. The services of the Organist do not automatically come with booking a wedding, and require a professional fee. You must contact the Organist about playing for your wedding, contracting other musicians, and/or approving other musicians at least six months in advance. You must make your own financial arrangements with the Organist. The musician fees must be paid in full prior to the ceremony. The Organist will be glad to help you engage the services of an instrumentalist or vocalist for your ceremony, or to work with a soloist of your choosing. The rehearsal time must be planned around the schedule of the organist and availability of the space with the College, and may be subject to an additional custodial fee. The College address is 106 Central Street, Wellesley, MA, 02481. That's at the intersection of Route 16 and Route 135. Click here for a Campus Map to search and get directions to various campus locations. Click here for directions to Wellesley College by car, plane, bus, or via public transportation. You may park in the Davis Parking Facility. If you have any questions about parking, please go to the Campus Police Department, located in the Davis Parking Facility. During summer months, parking is available in the Founder’s Lot, adjacent to Houghton Chapel. There is no guard/attendant during the summer. If additional space is needed, please use the Davis Parking Facility. Please remind your guests that their cars must be moved from the parking facilities immediately following your rehearsal and ceremony to accommodate the next scheduled event. The organists listed below have been pre-approved by the Office of Religious and Spiritual Life (ORSL). The Pianists listed below have been pre-approved by the Office of Religious and Spiritual Life (ORSL). The AV Technician listed below has been pre-approved by the Office of Religious and Spiritual Life (ORSL). To request a date for your ceremony, please contact the Coordinator either by email or by phone. Please note that approval process may take up to one week and that all reservations are not final until approval has been given by the College. For weddings, in order to provide each couple and their guests a quality experience, please note that our primary wedding season is during the summer months between mid-June and mid-August. Weddings, however, may be booked during the academic year if they do not conflict with other campus events. College events have priority over the scheduling of weddings and rehearsals.